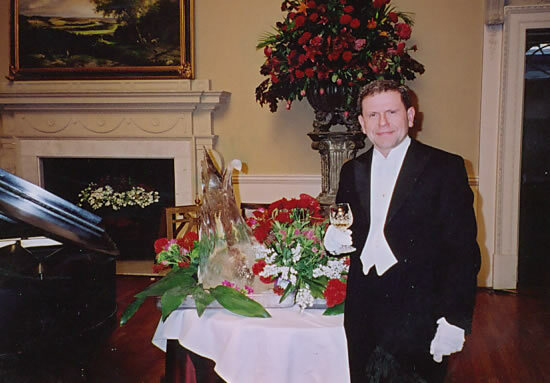 Steve Apelt is a performer & actor who specialises in producing 1st class events, shows & entertainment. 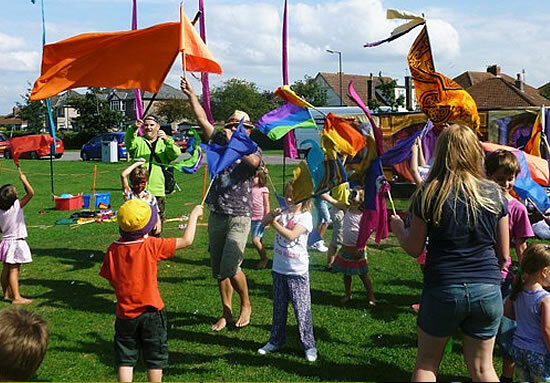 Steve concentrates on providing events for young people and their families. Once owner of Blue Moon Theatre Company and Scratch Productions. Steve has now amalgamated all his work into one touring company ‘Steve Apelt Productions’. first in the USA and then Europe, teaching drama, performing and arranging events. Born in 1962 in the lovely county of Somerset, Stephen Michael Apelt is the only son of Werner and Greta Apelt both originally from Germany. 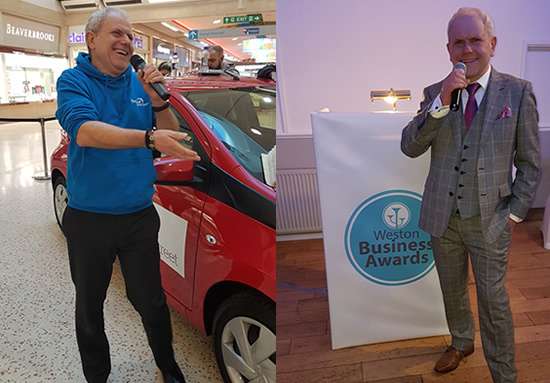 Steve was educated at Sydenham Comprehensive School, Bridgwater and within a few years followed his passion for travelling and working with young people. After years of globetrotting and living in U.S.A and Austria, in 1993 he returned to the UK to take up a position of Redcoat at Butlin’s. After 3 year’s treading those particular boards he was out looking for a new challenge. He had a spell in London working on various TV programmes, before returning to his home town of Bridgwater. There he joined forces with Su Squire and Mark Scott-ison after meeting them at Bridgwater Art Centre and founded Blue Moon Theatre Company. The Company went on to produce over twenty different touring productions since its formation in 1999. 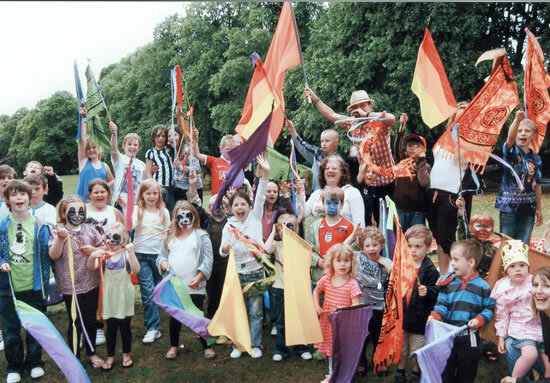 Early work was a mix of street theatre, story telling and children’s theatre. 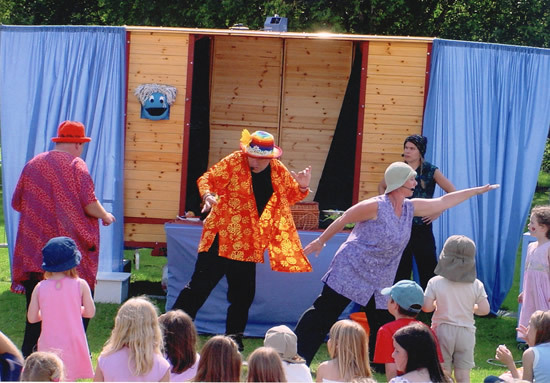 In 2004 the same artistic team formed another company, Scratch Productions, specialising in Street Theatre. On the small screen Steve has appeared in various commercials and TV parts. Two, which will always stick in his mind, was spending two weeks in the highlands of Scotland dressed only in animal skins (Discovery Channel) and playing a Christmas Turkey in a Sainsbury’s advertisement. 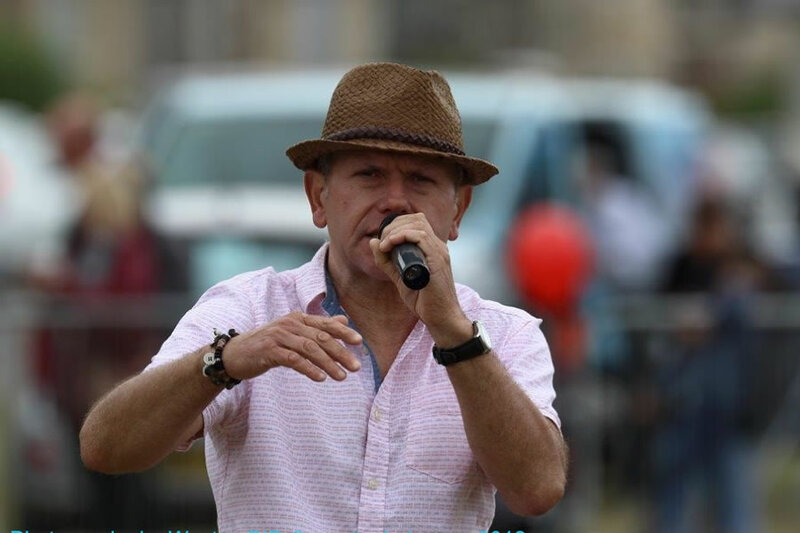 In addition, Steve works regularly as a freelance Event Organiser and Compere. 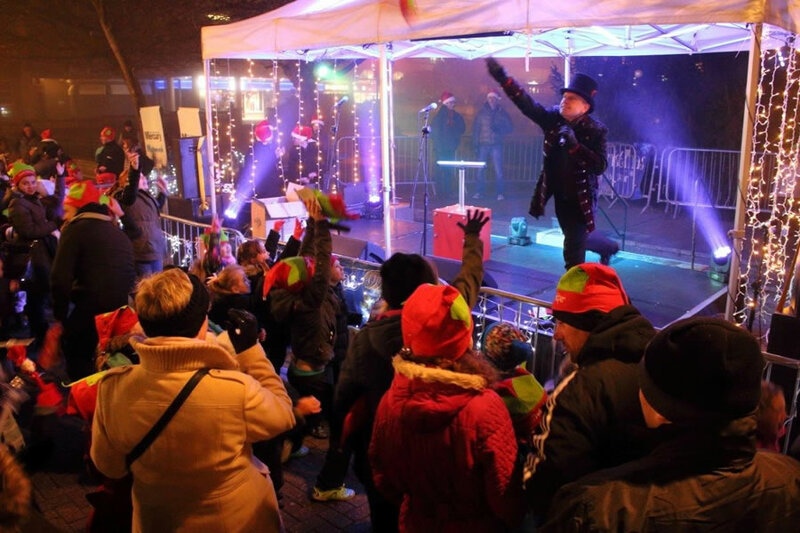 His credits include a wide variety of events including festivals, gala cabaret nights, switching on of Christmas lights and large-scale community events plus the odd It’s a Knock Out. 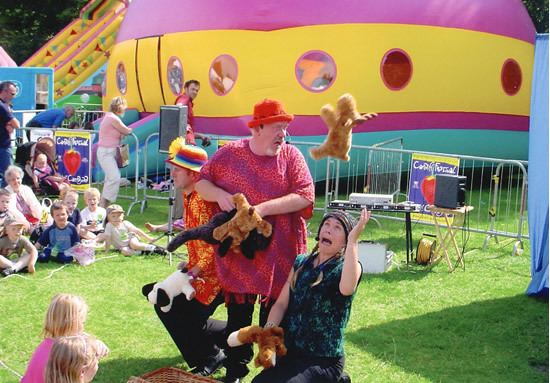 In 2012 Steve created a new touring company called Steve Apelt Productions, providing Steve with a platform to produce and perform in alternative street theatre. 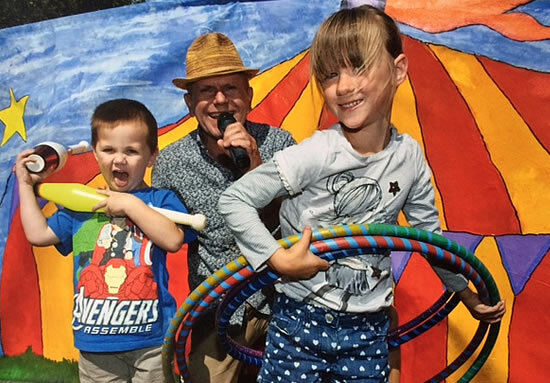 Steve’s real hobby is his work, but he does have a great passion for art and the environment, he has written two children’s book’s one on recycling and one about woodland animal’s on an adventure. One of his biggest achievements was producing a piece of “Land Art” over eighty meters in diameter (on a really windy hill). Work takes up most of his time but any free days are now spent travelling Europe or the U.k in “Flower”, Vanda and Steve’s lovely VW camper van. Co-founder of Blue Moon Theatre Company and Scratch Productions. 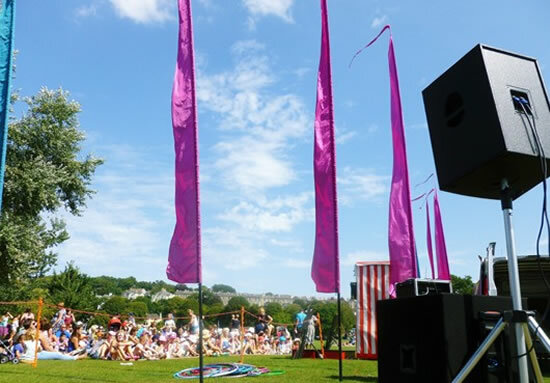 and Outdoor Performances with Drama and Educational workshops. humorous performance pieces which included plenty of audience participation. Compering festivals and presenting events are one of Steve’s great passions. 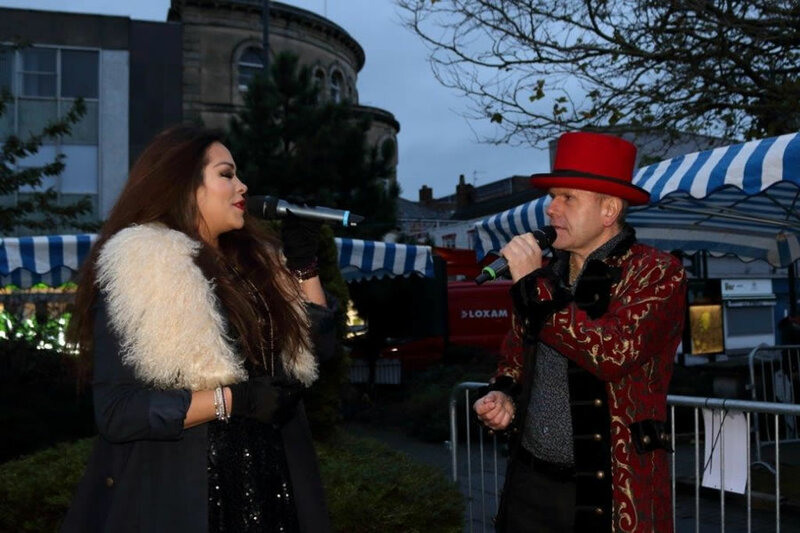 He has presented many different large scale events including Music Festivals, Switching on Christmas lights and even a few It’s A Knock Out’s. 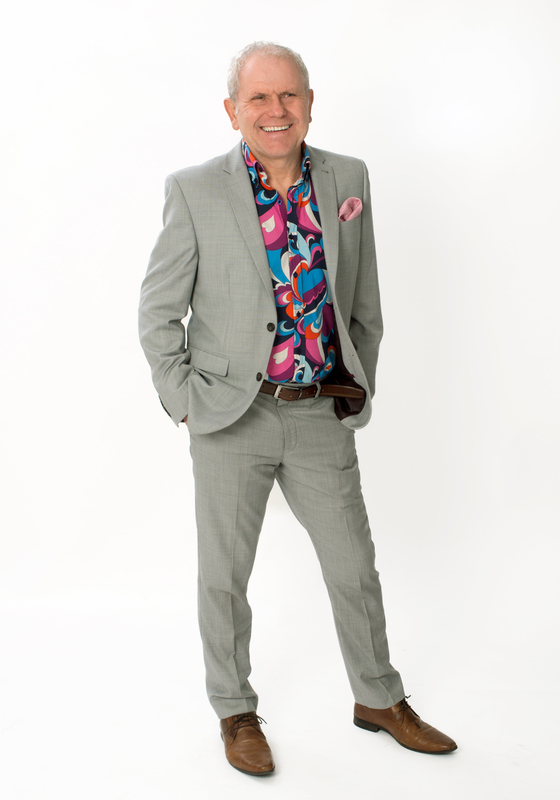 Since leaving Butlins in 1989, Steve has appeared in various TV commercials, from advertising cars to soap powders. Other roles on the small screen have been wide and varied. 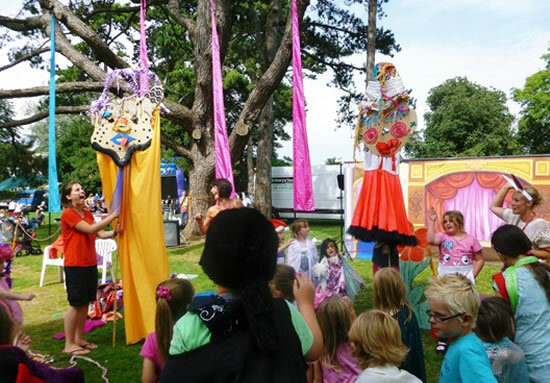 Steve’s solo shows take the audience into a world of fairy tale and can be tailored especially for Early Years and Themed Events. 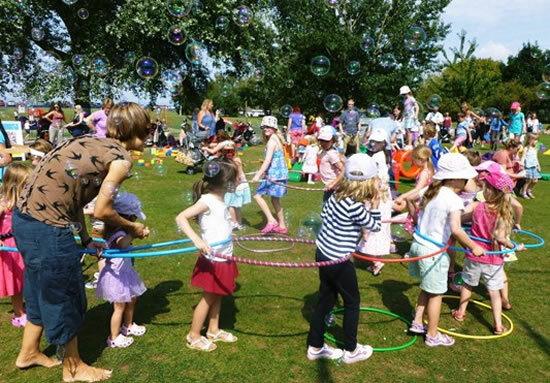 All shows include a host of fun, slapstick plus a lot of bubbles and snowy foam!! 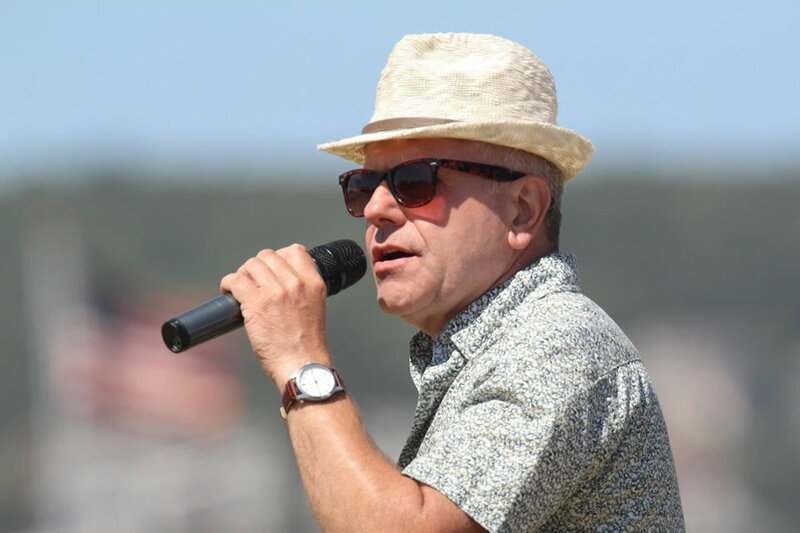 Producing and hosting Live Events for over 30 years has allowed Steve to explore and develop the best activities to give the broadest and most exciting event possible. Steve’s New Solo Street Performance. Prepare to be stunned by the Magical Musical Bike as it comes around the corner at your Festival, Event, Street Party or Corporate Event. Steve has written and self published two children’s picture books, both of his books have been inspired by working with young people. Steve’s work currently keeps him busy but he is always dreaming about a third book! You were wonderful as always and we love having you perform at our events. I just wanted to say a big thank you. You did a fantastic job under bad weather conditions. The children had a fantastic time and their faces were a picture. That’s what it is all about. I had to contact you again to say a huge thank you for what you did for our event. You were an absolute star and made the day run with so much fun and enthusiasm. Eveyone I spoke to couldn’t praise you enough for your professionalism and wonderful character. Really hope you can help us take this event forward as we are already planning next year. It would be a travesty if your not part of it. Thanks again Steve, you are a truly wonderful individual, it’s a shame there aren’t more in the world like you. You presented everything so smoothly. Many thanks for all your support and making the entertainment such a success. 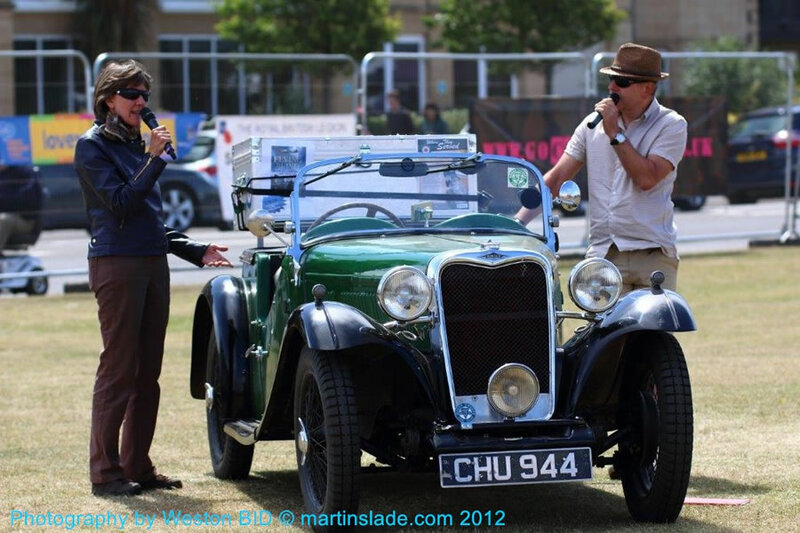 Hope we can work together again, I would happily recommend you to other organisation’s running similar events. Now the dust has settled on another Carnival I thought it was time I wrote to thank you for your performance in the town on Carnival day. The audience and children in particular, really enjoyed eveything you got up to. Thank you sooooooooooo much for running the alternative panto. The feedback I have had is fantastic and we would certainly like to book you again. Now that the dust has settled on Saturday evening, I just wanted to say thank you very much for all your hard work at the event. The event went extremely well, thanks to your expert management and presentation skills. It is not easy to manage a large event and to keep eveyone focused on the stage but you did it! Everyone I spoke to said they had thoroughly enjoyed the evening. The press coverage has been extremely good and it will stand us in good stead for future events in 2018. It was great working with you and I do hope we shall find an opportunity to work together again in the future. Once again, on behalf of the Chamber of Commerce, I offer heartfelt thanks for a job well done!